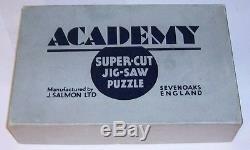 A vintage 1920's wooden (plywood) jigsaw puzzle made by J. Salmon Ltd, Sevenoaks, England, under their "Acadeny" brand, but this is a rare Super-cut Jigsaw Puzzle. A 400 piece puzzle of a coaching scene, complete, one roof piece has broken in two at a narrow point, no loss but minor traces of glue from an old attempt to repair, please see close up photo below, otherwise in good condtion. The sky, road and edges are cut with the standard Academy interlocking cut, but the rest is non-interlocking push-fit and cut along the contours of the picture - please see photos. In its original box which is in good condition with minor signs of its age (small black and white guide picture underneath box). The item "1920's Salmon Academy Super-cut wooden jigsaw puzzle 400 pieces coaching scene" is in sale since Friday, January 08, 2016. This item is in the category "Toys & Hobbies\Puzzles\Vintage Puzzles\Jigsaw". The seller is "peterdonpgte" and is located in Newark.